Cyprus expects the US to put into practice declarations on global concerns, which Barack Obama had made in his address at the UN General Assembly, with regard to the question of Cyprus, the President of the Republic Demetris Christofias has said. 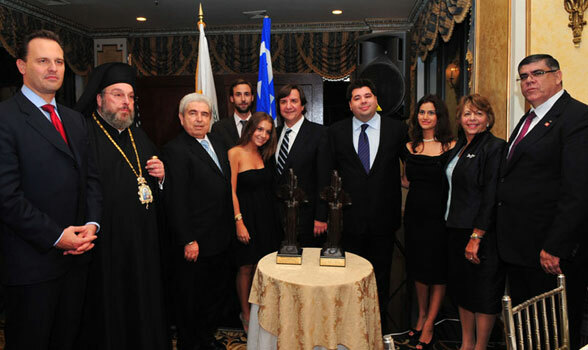 The honorees of the 2010 Cyprus Federation of America Annual Awards dinner with family members, president Christofias, Greek Foreign Minister Droutsas, Metropolitan Evangelos and Peter Papanicolaou, president of the federation. Photos: Dimitris Panagos. ”We want international law, peace, human rights and the fundamental freedoms of our people to prevail in Cyprus. We are not second class people,” President Christofias stressed, speaking at the annual dinner hosted by the Cyprus Federation of America on Friday. The Cypriot people, he continued, “have thousands of years of tradition and contribution to the world’s cultural heritage. And that I think will be taken into account in formulating policies”. Referring to developments in the Cyprus issue, he said that as President of the Republic he has inherited a very difficult situation. ”The fait accomplis of Turkey’s illegal occupation are being consolidated on the ground and make the solution of the problem more difficult,” he said, noting that although some steps forward have been made, there is concern about developments in the Turkish Cypriot leadership. Addressing the Turkish Cypriots, he said they too are children of the same homeland just as the Greek Cypriots are. “They too have watered with their sweat the Cypriot land, they have fought with Greek Cypriot workers to be able to enjoy the good things in life. They also have the right to co-rule with us under a constitution for a bi-zonal, bi-communal federation with political equality and the right to participate in the federal institutions,” he added. President Christofias thanked Greece and Prime Minister George Papandreou for the unselfish support they afford Cyprus in the struggle to find a solution. In his remarks at the dinner, the Greek Foreign Minister Demetris Droutsas assured that ”Greece stands by Cyprus and the Cypriot people, not just with words but with actions”. Droutsas stressed that the latest proposals submitted at the negotiating table by President Christofias are correct and show the direction to be followed. He called on the Turkish Cypriots and Turkey to follow this constructive stance and make the right moves necessary for a solution. U.S. Congressman Frank Pallone spoke about the need for Turkish occupation troops to withdraw from Cyprus’ northern part, stressing that the U.S. should take a clear position on human rights and the rule of law. Congressman John Sarbanes assured that the struggle for Cyprus will continue in Washington. President of PSEKA Philip Christopher paid tribute to the 58th Anniversary of the Cyprus Federation of America, an umbrella organization of various Cypriot American Societies. “Here we all united”, Philip Christopher expressing support for the President’s efforts to reunite the island. “We are only 50,00 Greek Cypriots in America, but we are making a lot of noise because we are part of the 2 million large Greek American Community and we are all united in this cause. This community supports President Christofias and his government. We support him the way we supported his predecessors. 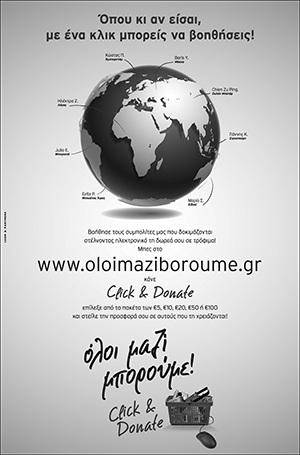 We support every democratically elected government in Cyprus and Greece and we work for the national issues”. Cyprus Federation President Peter Papanicolaou spoke about the long efforts of his organization to promote the Cyprus problem, Greek Culture and heritage and philanthropy. He thanked President of Cyprus for attending CFA’s annual event for second time in a row, showing thus his respect for the organization and the Cypriots of America. “Mr President, you have our unconditional support in your efforts to reunify Cyprus”, Papanicolaou said. He also thanked the Greek officials that attended the event, especially Foreign Minister Dimitris Droutsas. “You have proven to be one of us”, Papandreou said. Finally he paid tribute to the honorees, George Tsunis who received the “Justice for Cyprus Award” and Dr. Panagiotis Manolas who received the “Lifetime Achievement and Philanthropic Award”. Previous article Cyprus Issue: Presidents Christofias' Remarks to U.N G.A.